Original Eagle Brand Lemon icebox pie recipe with just 3 ingredients is an easy dessert that is perfect for summer. A thick layer of puckery lemon filling is poured into a no bake crumb crust and chilled or frozen until ready to serve. Best of all – it tastes just like you remember it. Summer in Texas is hot — but we still have to deal with the rampant Southern sweet tooth gene. No bake pies are the answer no matter what the question is. I’ll admit a preference for no bake chocolate pies like this chocolate overload pie or this no bake s’mores pie. Still if you had this lemon pie and those two chocolate pies on a table and told me I could only have one there might be some tears. OK. A lot of tears. One of the things that I like best about this lemon pie is that you can serve it chilled or frozen. I personally like it better frozen. I take it out about 20 minutes before I want to serve it… less if it is a very hot day. I thaw it just until it softens a little but still has the consistency of ice cream. 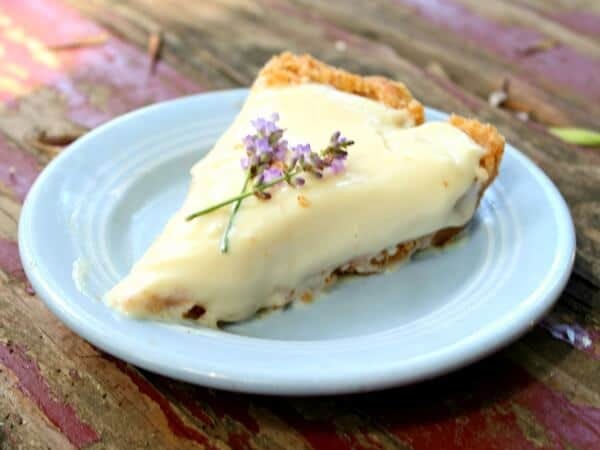 Lemon icebox pie is tangy and icy that way — a fact that makes it very refreshing on one of our hot Texas days. When just chilled it has a creamier, softer consistency and that’s good, too. So, when you make it make a couple of them and keep them in the freezer for unexpected company or a sudden dessert craving. Covered tightly it will last 3 months or so. Here’s something cool, too. You can substitute the lemon juice with lime and have a no bake lime icebox pie. I have been wanting to experiment with other citrus but I haven’t yet. Really, any citrus juice should work. Let me know if you try something besides lemon or lime. You can serve it with a dollop of whipped cream if you like. I usually serve it plain because I think the whipped cream is just too much richness. I prefer mine either plain or with a fresh raspberry or blueberry coulis. Just whirr the fruit in the blender with a little sugar to taste and drizzle it over the pie. I used a combination of ‘Nilla wafers and pretzels in the crust for this pie. Here’s my favorite no bake crumb crust recipe and a lot of variations that I use. Another good crumb mixture for the crust is to use lemon sandwich cookies and gingersnaps in a ratio of about 3:1. It enhances the lemon flavor. Lemon icebox pie has been served on countless tables and caused countless families to smile at dinner time. It’s Southern recipe that’s been around close to 100 years. I have tweaked it a TINY bit by adding vanilla. I think it calms the tartness of the lemon down a little, soothes it, and makes it more enticing. Feel free to leave it out. Y’all know that I am not real freaky about brand names except there are some that I feel are higher in quality and produce a better finished product. You can get the Eagle Brand or you can use what you like best but if you get an off brand of sweetened condensed milk I will not guarantee the recipe. I like Eagle Brand. It’s been around forever and the results are always good. They didn’t sponsor the post or pay me… I just like the product that they create. End of sermon. Coconut Praline Pie – Imagine a layer of rich praline sprinkled with a generous handful of buttery rich toasted pecans then topped with the creamiest coconut cream pie filling you’ve ever put in your mouth AND THEN topped with whipped cream and more toasted coconut. It’s the stuff dreams are made of. German Chocolate Pie has everything in it you love about the cake but in a creamy, no bake pie form. SO good and always popular. 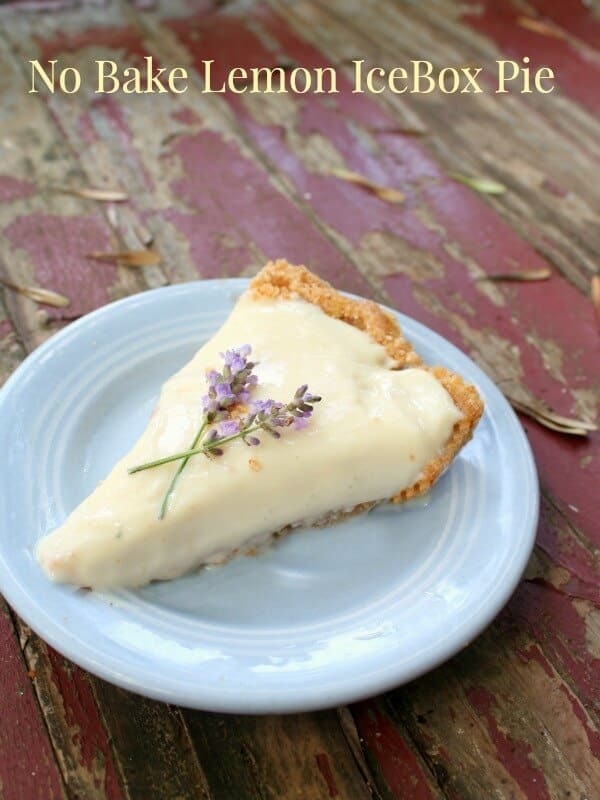 Lavender Lemon Meringue Pie has to be baked but it is so worth it! The lavender adds a special touch and enhances the lemon beautifully. S’Mores Pie is a no bake pie that tastes like your favorite campfire treat!. Strawberry Lemonade Freezer Pie from the Cookie Rookie looks like it would fit in my fridge just fine this summer – what do you think? This pie just couldn’t be easier! This is a great one to take to a potluck or summer picnic and I love to show it off in a pretty pie plate in my favorite color! I honestly can’t imagine a summer without copious amounts of this pie to cool things off. It’s been popular for generations for a good reason! Definitely give it a try and see if it doesn’t take you right back to those endless summers when you were 10. This easy no bake lemon icebox pie is tangy and creamy. You can serve it frozen or just chilled — and best of all you can make several and keep them in the freezer for when you need a quick dessert. Mix the Eagle Brand and vanilla. Add the lemon juice and lemon zest, stirring with a whisk until it thickens. Pour into the chilled pie crust. Chill for 4 hours or freeze overnight. If frozen allow to stand at room temperature for 20 minutes before serving. This was such an easy recipe I loved it. My guests love the cool, lemon flavor on a warm afternoon. It’s my new go-to summer treat. It’s so easy too! Glad you liked it.